As a classically trained stage actor, and mesmerizing talent on screen too, this gentleman from Oxford England is THE REAL DEAL. Whether you have seen him in Spielberg’s LINCOLN, or in his breathtakingly real portrayal of Dr. Martin Luther King in last years academy award nominated film SELMA, this multifaceted actor has proven he can DO IT ALL!!! 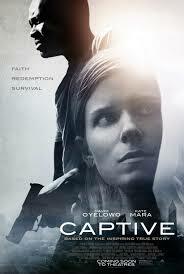 In his next film and role, Oyelowo plays killer Brian Nichols in the real-life drama ~ CAPTIVE. HAVE YOU HAD THE OPPORTUNITY TO VISIT ST LOUIS BEFORE? Yes, I have… a few times actually. We have very good friends who run the St. Louis Family Church…and my kids sometimes go to their summer camps…I LOVE ST. LOUIS! WERE YOU ABLE TO MEET BRIAN NICHOLS? I wasn’t, NO. The nature of his sentence means you can’t have access, But I did get to meet his mother, which was very intense as you can imagine. The thing that was extraordinary about meeting her, even 10 years on, is that she still can’t quite believe that this is her life, and that this was her son that did this. It is still reverberating for that family, if you can imagine. DID YOU HAVE MUCH FOOTAGE TO STUDY OF HIM? Yes, of the trail mainly. Not before hand. My primary source for getting under the skin of Brian was Ashley, really. She remembers this event as if it happened yesterday, and she was on the set with us through quite a lot of the shoot. DID ASHLEY SMITH HAVE MUCH INFLUENCE BEING ON THE SET? She had influence in so far as ~ not from a creative point of view, but more from a factual point of view. I was very keen, because I couldn’t speak to Brian, and because I was limited in being able to talk to people who knew Brian, I just wanted to make sure that what we were doing felt true, felt like it was authentic to the experience. It is one of those stories where is no need to embellish anything, All of It literally it played out like a movie. When you think about the fact that Brian Nichols kills those people in Atlanta GA, and then it was a 45 minute drive to Duluth GA, and it was an apartment complex, and then he finds his way into her specific apartment. You couldn’t write that, is the truth of the matter. So for us it was about sticking true to the story, and that was primarily her function for us while we were shooting the film. DID YOU HAVE ANY SECONDS THOUGHTS ABOUT PLAYING BRIAN? Yes, I did. Because I know what it costs me to play these roles. You can’t phone that in. My job as an actor is to fully inhabit the character. And, when I say “that costs”, with a character like Brian Nichols, unlike Dr. King, Dr. King is someone who I hugely admire, and what an honor to get to play him. I so valued getting to go on that journey. Brian Nichols and what he did, and who he is, didn’t have the same draw, for obvious reasons. But, my job was the same. Your job as an actor is to not judge your character. You have to be able to understand why they do, what they do, when they are doing it, so that you function as a three dimensional human being that people can believe. DO YOU THINK THAT YOUR ROLE AS AN ACTOR IS TO GARNER SYMPATHY WITH A ROLE LIKE THIS? WHAT WAS IT LIKE WORKING WITH KATE MARA – WHAT DID SHE BRING TO THE ROLE? WERE YOU FAMILIAR WITH THE PURPOSE DRIVEN LIFE BEFORE YOU GOT INVOLVED IN THIS PROJECT? ASHLEY ESCAPES DEATH at the HANDS OF BRIAN, BECAUSE HER LIFE HAS PURPOSE, SO SHE MAKES IT THROUGH THIS ENCOUNTER. BRIAN ESCAPES DEATH TOO, AS HE WASN’T GIVEN THE DEATH PENALTY, SO WHAT DO YOU FEEL IS HIS PURPOSE? I am a believer in life beyond this life. And I think that his purpose is to embrace that. It is to embrace the fact that his has run out of credit, so to speak, here on this earth, but beyond this life there is hope for him. I believe that God is a redemptive God. A God of forgiveness. Ashley was stopped in her journey, just before it was the point of no return. There was a purpose for her life, in that, look, here we are talking about a movie about her life. THAT IS PURPOSE that came out of that very dark situation. She regained custody of her daughter. She remarried. She has another two kids.